Paolo Sorrentino’s first English-language film is a portrayal of displacement. 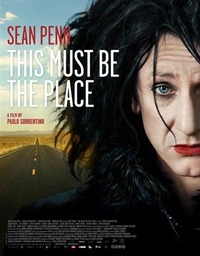 Sean Penn stars in a wonderfully eccentric and mannered performance as Cheyenne, a reclusive Goth rocker who now lives in Dublin with his firewoman wife, played by Frances McDormand. He wheels his trolley through shopping centres and down terrace streets. Pestered by his own fame, he seems lost, both superficially by the onward rush of musical fashion that has left him high and dry, but also by a more existential angst and regrets about what his music has done in the world and his own culpability. When news reaches him that his father is closet to death, Cheyenne travels to New York in the hope that he can mend some bridges. Upon arriving, however, he finds his father has already passed on. He finds something like a mission, however, in completing his father’s work of hunting down the ex-Nazi who tormented him, and is now believed to be living in the States. From this point on the film turns into a road movie, with a series of encounters of varying likelihood and interest. The film is as indulgent as its main character, and seems, like him, to wander - in effect looking for a story. The use of the Holocaust in this context could be seen as highly problematic (Philip French has compared it to Roberto Benigni’s Life is Beautiful ) and I shall explore this topic further in my Alternate Take. Cheyenne is a Wandering Jew, looking for validation and authenticity who must learn at some point that his own inauthenticity is part of the problem, starting with his absurd name, which recalls/uses/pays homage to/erases another genocide as well as reminding us of a child playing cowboys and Indians. It also might recall the great Goth band Siouxie and the Banshees. He is basically a little boy who has refused to grow up. Penn’s performance will undoubtedly divide audiences, but the ticks (hair blowing and silly laugh) and childlike falsetto are coupled to a savviness and wisdom that makes his former success and charisma plausible. Cheyenne may look ridiculous, but there is a seriousness that can make a claim for the compatibility of complex emotion and daft hair. Sorrentino’s films are always visually striking (see The Consequences of Love  and Il Divo ) and the road movie as a genre, gives him ample scope. No filmmaker currently working today makes such remarkably colourful films. This vivid palette reminds me of Bertolucci at his best. Perhaps inevitably, narrative sometimes seems of less importance. The addresses of various people that Cheyenne must meet appear to be dictated by the photogenic nature of the state rather than any real reason as to why the character might live there. However, that said, Sorrentino and his co-writer Umberto Contarello have produced a witty script which allows its protagonist to wander whimsically even as it grounds itself in a sharp intelligence and humour. Taking its title from a Talking Heads song, and featuring a musician as its lead character, the soundtrack of the film has to be good, and it is. Written, appropriately enough, by David Byrne, it avoids pastiche, and Byrne’s own appearance in the film as himself is one of the highlights, allowing Sorrentino a moment of breathtaking ingenuity which also acts as an homage to Jonathan Demme’s quintessential concert film Stop Making Sense (1984). This review was published on April 10, 2012.